How to attract and retain management consultants. Recruitment giants LinkedIn and Indeed have both recently carried out major surveys looking at candidate attraction which, by implication, may also serve as a blueprint for staff retention. Indeed revealed that three-quarters of survey respondents to the Harris Poll were “actively looking or open to a new job” and 63% had been looking at new job opportunities each month. Dissatisfaction with their job was given as the main motivator for leaving (not exactly a revelation), while the key attractions to candidates were attractive pay and location. It should be noted that while this appears to be a valid statistical sample of candidates (not just Indeed users) there was no information on the composition of the sample, which was presumably a cross-section of the entire workforce and therefore included unskilled labour. LinkedIn‘s survey considered the rise of the “warm passive” job seeker, which when combined with active job seekers, suggests that 87% of workers could consider a job move! Respondents cited career opportunities as their principle motivation. LinkedIn’s survey methodology relied on a sample of their website’s users responding to emails (it can therefore be assumed that this will include more “professionals” than Indeed’s survey). Both surveys recognised that while pay and benefits were often not the main consideration for a job move, they certainly played a key part in the decision to accept a new role. Is this also true for management consultants? While these are certainly useful surveys, management consultants can be considered a unique breed, therefore it’s unclear how applicable the findings are to this profession. Prism Executive Recruitment have since questioned 92 current job seekers, all of whom are career management consultants and asked 22 management consultancy employers to relate their experiences. Source: Candidates registered with Prism Executive Recruitment Oct 2015. 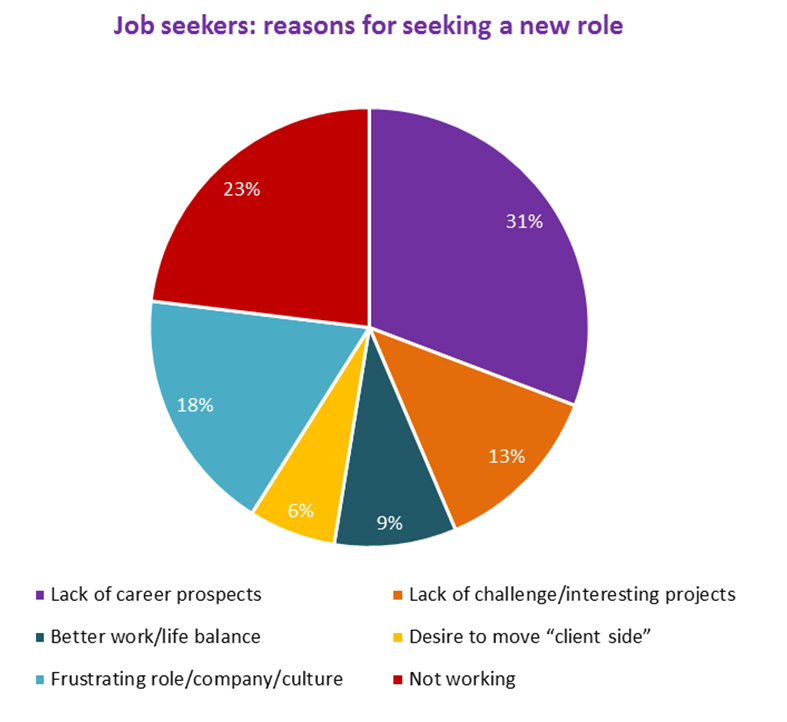 A perceived “lack of career prospects” was given as the main reason by both job seekers and employers for consultants leaving their jobs. Among candidates this was often allied to other considerations e.g. those employed by IT companies cited the “non-core” nature and “low priority” of management consultancy as a key factor. Management consultancy employers regarded “work-life balance” to be an important consideration behind any job move, perhaps reflecting the perspective of departing employees moving client-side, which also featured as an important factor. Achieving a more favourable work-life balance was frequently cited as a contributory factor by management consultants when weighing up potential job opportunities, but this was rarely regarded as their primary motive. A desire to move “client-side” was also reported by some job seekers, who also expressed a “desire to have more accountability for work” and to reduce travel. Amongst the candidate population a significant factor, not mentioned at all by employers, was the very basic one of needing a job! Whether because of redundancy, personal reasons, contracts drying etc. up many consultants seeking a job were not working. Furthermore, candidates also referred to a lack of challenge or interesting work as a key motive behind pursuing new job openings, often linked to the dominance of technology-led assignments. As an employer more formally put it “the operating model doesn’t support them i.e. they can’t do the management consulting jobs they want to do”. Money was rarely mentioned as a reason for changing jobs, although it was more commonly cited as an influencing factor when considering new opportunities. Finally another concern for management consultants was a somewhat amorphous one of frustration with the employer, role or company culture. A frequent comment related to changes in company direction and strategy. So what can employers of management consultants do? It is far better to retain staff than hire new consultants. Not all employers can ensure great career prospects or fulfilling work but what’s important for staff retention is that employers should direct investment of leadership time and company resources into trying to resolve these concerns on a personal basis for individual employees. It is crucial that employees feel valued and appreciated: when they do not “frustrations” increase and a negative mindset can develop, with a belief that the grass on the other side of the fence has to be greener. Similarly, employers and employees of course have to follow the client work: however with a relatively small amount of effort, creativity and flexibility many employers could do much to reduce the burden of periods away from home and therefore mitigate a significant trigger factor in job moves. To enhance employee attraction there needs to be a major rethink by most employers who typically focus on the virtues of the company or job, but rarely the career prospects, culture or client work despite clearly recognising the importance of these factors, as the survey demonstrates! As salary is usually bespoke it’s more difficult to use that at the outset to attract management consultants to a job opening. Nevertheless salary should form a primary consideration at the point of offer. In Prism’s experience, the starting point in negotiations is too often “what’s the minimum we can get away with?” instead of “what will delight the candidate?”. If there can be any concessions to work-life balance that might act as differentiators, these should be highlighted very early in the process. Lastly, do not forget out of work management consultants! There are many advantages to this group and while they may be easier to locate than passive job seekers, they do require specific sourcing strategies and usually a much swifter process. For an informal discussion about how Prism Executive Recruitment can help you attract and retain great staff, please contact Chris Sale, Managing Director [email protected] 0203 755 3641 or 01784 898049.